2015-Onwards: Doctor of Philosophy (PhD) in Evolution, Ecology and Genetics at The Australian National University. Thesis supervisor: Prof. J. Scott Keogh. 2013-2015: Master of Philosophy (MPhil) in Evolution, Ecology and Genetics at The Australian National University. Thesis supervisor: Prof. J. Scott Keogh. 2007-2011: Licenciatura en Ciencias Biologicas (four year degree in Biological Sciences). Pontificia Universidad Catolica de Chile. 2018. Human Biology (BIOL1008), The Australian National University. Lab demonstrator. 2018. Big Questions in Biology (BIOL3201), The Australian National University. Marking essays. 2017. Experimental Design and Analysis in Biology (BIOL2202), The Australian National University. Tutor and Lab demonstrator. 2015-2016. Australian Vertebrates (BIOL2111), The Australian National University. Guest lecturer. 2015-2016. Diversity of Life (BIOL1009), The Australian National University. Lab demonstrator. 2015. Human Physiology (BIOL2103), The Australian National University. Lab demonstrator. 2013-2016. Australian Vertebrates (BIOL2111), The Australian National University. Lab demonstrator. 2013-2016. Principles of Genetics (BIOL2151), The Australian National University. Lab demonstrator. 2013-2015. Molecular and Cell Biology (BIOL1004), The Australian National University. Lab demonstrator. 2013-2017. Evolution, Ecology and Genetics (BIO1003), The Australian National University. Lab demonstrator. 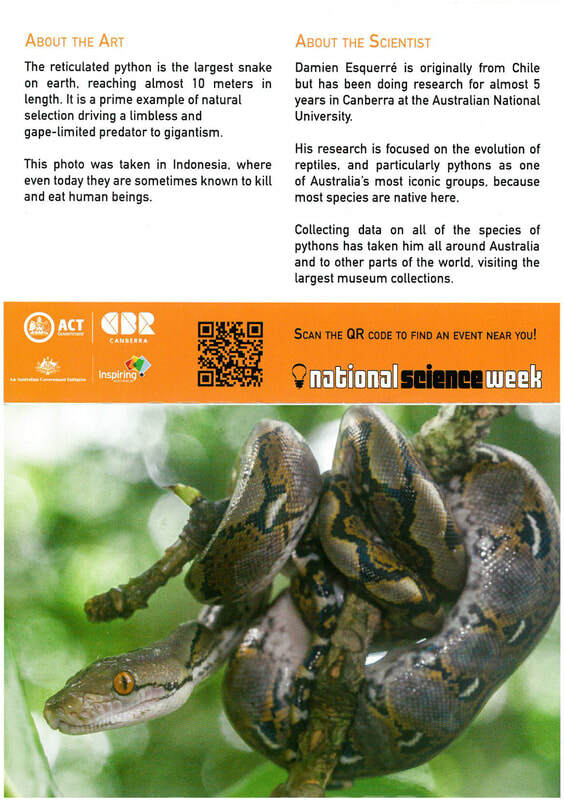 2017: One of my photos of a reticulated python was chosen to be published in a postcard for Australia’s National Science Week, together with a summary of my research. 2016: Co-Lab: Science Aeets Street Art. 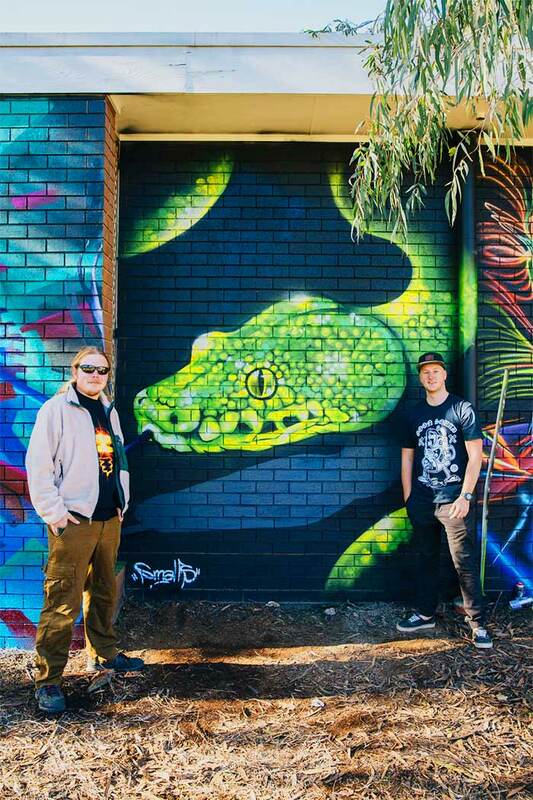 My research was chosen for the National Science Week, to be depicted as a mural by local street artist "Smalls". Link.